This activity comes with a boy and girl version of the mini booklet. 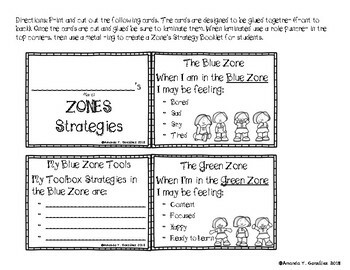 The booklet is designed to be used as a resource for students to keep in their desks, in classroom calm down or meditation stations, and/or to carry with them during transitions and refer to as needed. 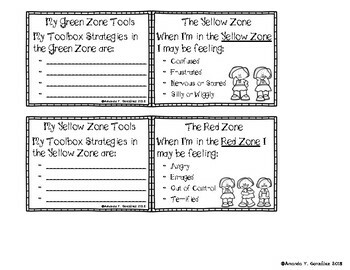 The activity was created to help build students' capacity to identify positive coping tools they may use when in the Blue, Green, Yellow, or Red Zones. The booklet provides example and visual images for each Zone of emotions or feelings. 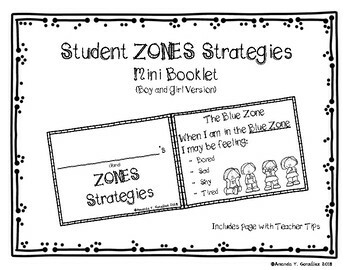 Students then are provided with one page per zone in which they may list up to four toolbox strategies that may be of help to them. 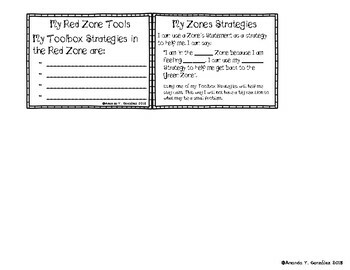 On the final page is an additional strategy with an example of an Zone-Statement message student can use. Provided in this resource are direction on how to assemble the booklet, as well as a page with descriptions of Toolbox Strategies to teach students, and a page with teacher tips.